I know. The title sound very strange but I can't find a better one. In a form (Access) I have a Web Browser control but the list members seems not to be for this control (see, please, the attached pics). The same control, in Excel environment, is OK.
Have you any idea about what happen ? will help you... to help me. Note, please, that I follow the instruction from post #5 to register shdocvw.dll. Also, I have searched in my computer the ieframe.dll but with no results. An answer to this question is more for my knowledge, do not burning me. My last option is to reinstall Office. 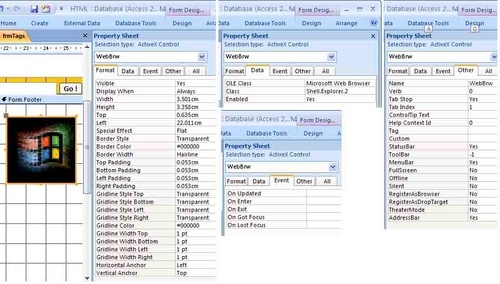 VBA's intellisense does not 'know' about the methods of ActiveX controls, Mihail, so what you are seeing are the generic methods of controls in general. 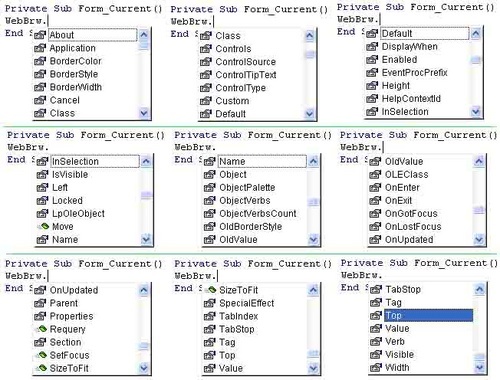 Calls to the methods of the ActiveX control should still work, but you have no direct way to see all of the methods via intellisense or the VBA Object browser. Indeed Stewart. It works as you say. Thank you ! I don't select yet your answer as the best answer because I have one more question. It is possible that the answer to this question to be the best one. In other Office applications (Excel, Word) intellisense work as is expected. Well I often use the treeview that comes with "Microsoft Common Controls 6.0" which is also an active X object. Lets assume that I have registered the dll properly, and that I have a form with a treeview control called tvFiles. I now get proper intellisense for the tv object. I just have to remember to set it to Nothing when my code exists. That's not how it works Mihail. I've selected Stewart's as it answers the question in the Original Post. This is the only criteria that should be used for determining which to select. But I still think that this thread should have as best answer a couple (Cause + Solution) = (Stewart + Smiley). Yours code is a little bit (or a little more) beyond my skills. I understand the idea but I don't know how to apply for my needs. Yours MsComCtrlLib should be mine shdocvw.dll ? Or other thing ? I think that, if you will be so kind to write a specific code for my damn WebBrowser control, I should be able to understand the code (and to use the idea next time). I am sorry, but I have no idea how much time involve this for you. If it is too much, leave it, please. It seems you don't appreciate the point then Mihail. Never mind. A thread should only have one question, and that should be asked fully in the first post and it should match the title. People searching for help on the internet will typically use the title to scan for what they want after googling it. The answer is not appropriate unless it matches the title and the first post. You ask question A. You then ask question B in the thread, or even clarify question A to mean something different from its original meaning. Someone searches and sees the title which matches the original question A. They don't want the post that answers your question B or even your amended question A. They want the answer that matches the original question A. That's why we don't allow multiple questions in a thread and we ensure the Best Answer is awarded to posts which address the original question specifically. PS. We don't currently have any facility for awarding multiple Best Answers. If it were ever introduced though, it would still be important that it follows the same guidelines and be used sparingly, otherwise it could dilute the benefits of having it in the first place. Is there en easy way to go from control to control?? Is there an easy way to move from control to control with Enter button? Control Browser Parameters with HTML code?